Ampeg B-15N from 1966 or 1967. The holy grail for recording studios. This one was in storage for 10+ years. When the owner brought it out to sell it it kept blowing fuses, which happens a lot with amps that sit for years and years without being turned on. Usually it is because of capacitors in the power supply. 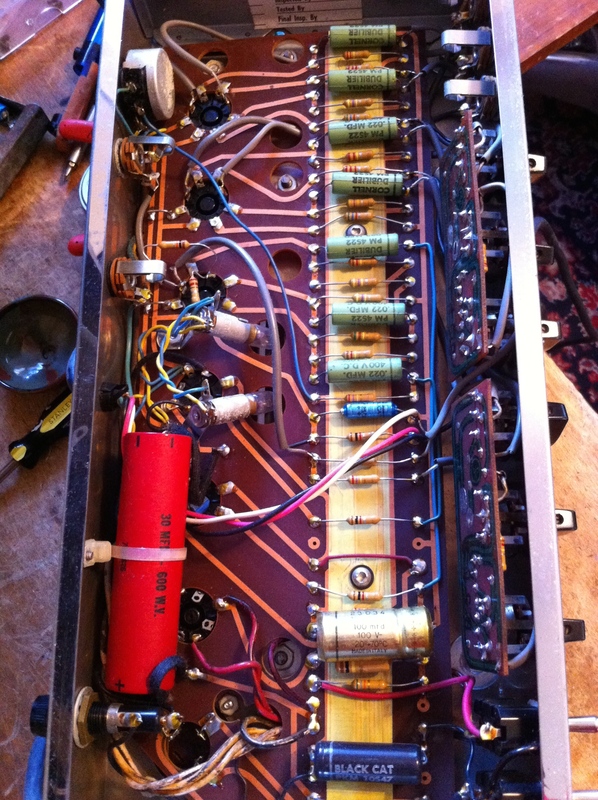 The caps are filled with a liquid electrolyte; when the amp sits for years without being turned on the electrolyte dries out and the cap short circuits when presented with hundreds of volts again. As far as I can tell this B-15N has never been worked on. It looks to be all original and even all the solder connections look untouched. Some of the caps in the preamp are made by Ducati??? Is this the same Ducati that makes motorcycles? People always want to sell vintage “all original” amps for big bucks, and that is nice for collectors and gear nerds and such, but when an amp is that old and it’s all original it usually means it does not work right, if at all. Amazingly, after some time put in troubleshooting, this amp still works right. It was blowing fuses because of dodgey solder connections in the power supply. I really thought power supply caps or the power tubes would have been causing this. They seem to work fine, albeit the power tubes are kind of poorly matched, but not THAT bad. Re-soldering the connections on the power supply caps and the power tube sockets did the trick. I left the amp original as per the owners request. Let the good times roll I suppose. 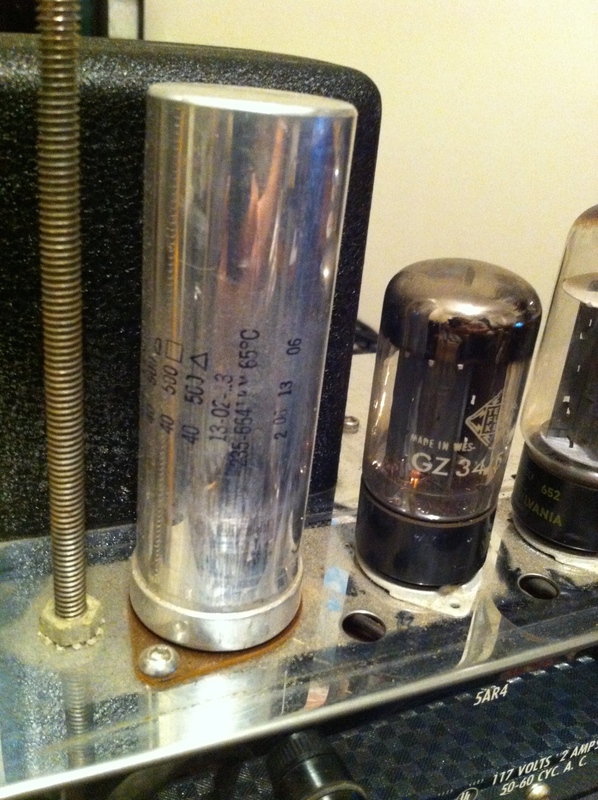 Tubes are old Sylvanias with the Ampeg logo screen printed on the base. 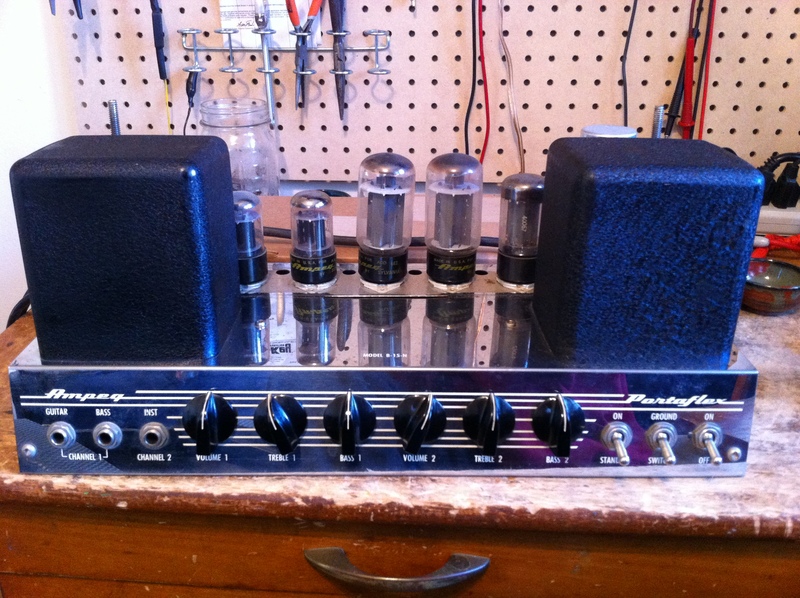 This amp has an incredibly low noise floor, even with 50 year old caps. Perhaps because the power and output transformers are shielded, completely enclosed in a metal casing with no gaps. Nice sine wave reproduction. 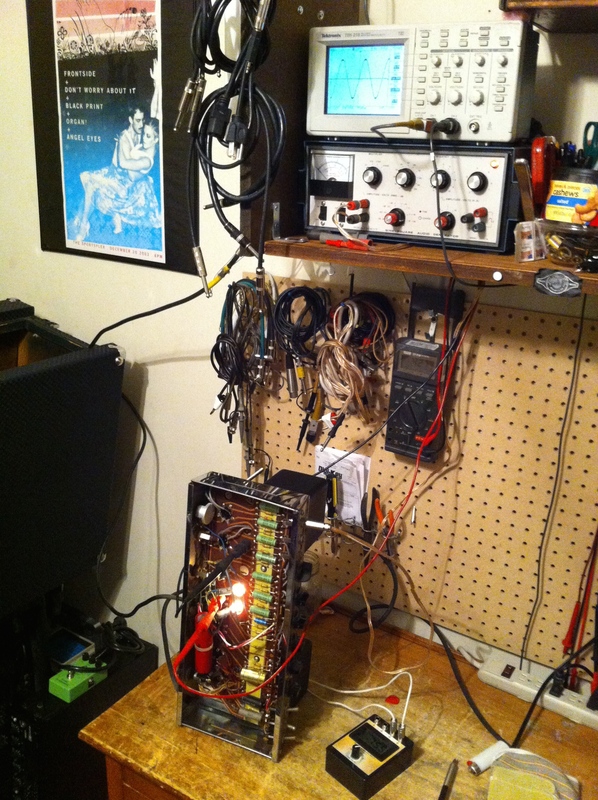 Clipping at 31W into an 8 ohm load, as it should. Old Mallory power supply cap reads 235-6641. 235 is the Mallory code, 6641 means it was manufactured during the 41st week of 1966. 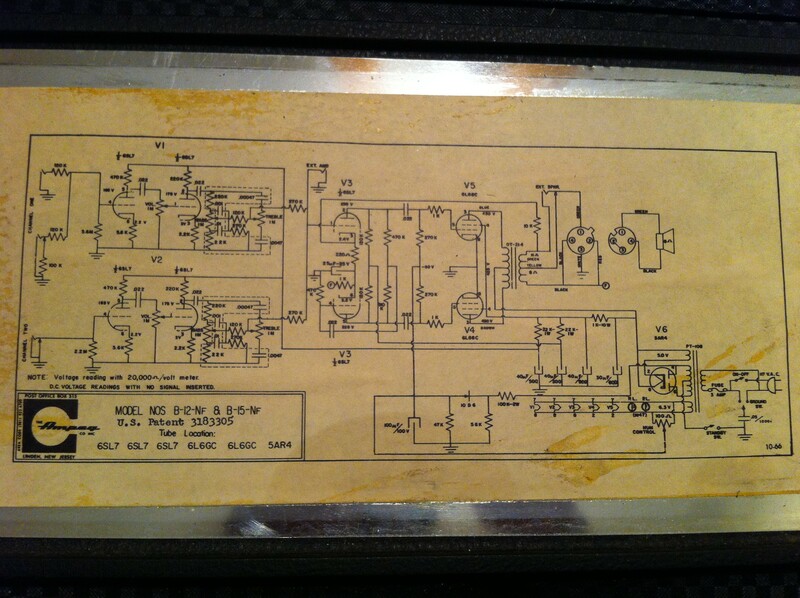 Gotta love how all the old Ampeg amps came with the schematic.